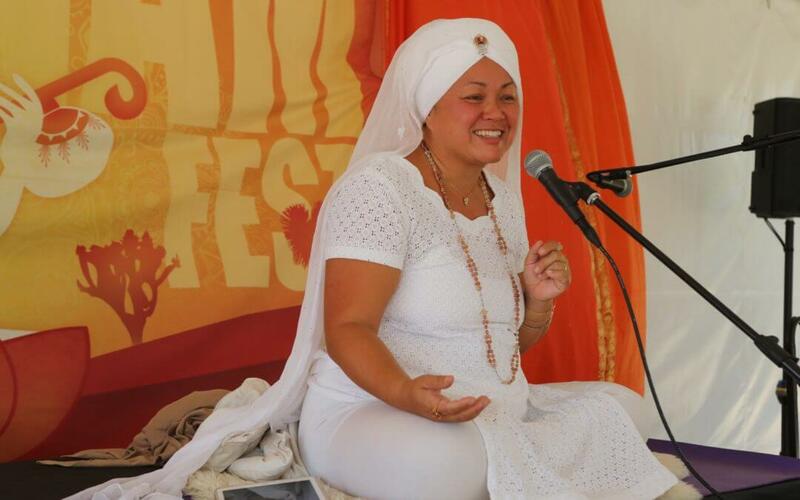 When it comes to fierce, precise, and enthusiastic delivery of the teachings of Yogi Bhajan, Dr. Haridass Kaur Khalsa triumphs. She has expertise in biomechanics and the use of Kundalini Yoga to alleviate chronic pain. We are grateful she took time to answer some questions. Read on; she’ll charm you! When someone is new to Kundalini Yoga, what do you like to tell them about this particular practice that always keeps you returning to these teachings and committing to this practice? Have fun! Laugh and try new things. Time will pass no mater what; the question is, will you be enjoying it? Take it easy, if you can’t do the exercise, don’t. Just relax, or watch others do the exercise. You benefit just by being in the room. Engage your breath. Just breathe throughout class. After all your years immersed in these teachings, how do you relate to yourself differently now compared to before you practiced Kundalini Yoga? Patience, kindness and acceptance. I am more relaxed now and can see how my mind is reacting. I think in the beginning I applied a lot of self-induced pressure originating from my mind or via insecurities and having to compensate. Now I just do the practice without much resistance. I was unable to see my mind’s immediate reactions. Now I can recognize it when it shows up and laughs about it. Oh the stories my mind tells itself! Can you share an experience or story of an impactful daily Sadhana you committed to over months that made a huge difference in your life? Absolutely. Never leave home without reading/chanting Japji as that really allows the natural rhythm of life to occur. My go to is 31 minutes of Sudarshan Chakra Kriya, 3 minutes of fists of anger, and 108 frogs. You have been teaching at Sat Nam Fest for years; can you discuss any changes you have noticed over the years? Or have you observed the ways in which getting together at this festival is contributing to creating deeper, more illuminated collective consciousness? Yes I noticed there are more and more people coming who have not experienced Kundalini Yoga before who are excited and just looking for a family friendly and fun environment. By being together in an uplifted environment that welcomes all ages, we are making stronger and happier families. The children’s program is growing and the amount of people going to Gurdwara is encouraging. There seems to be a deep thirst for connecting with the Soul. There are more and more people seeking and I am grateful for Sat Nam Fest for holding that high frequency. Is there anything you would like to say about the ways Sat Nam Fest is special, sacred, or unique among other festivals / yoga retreats? Sat Nam Fest is built around the basis of finding your own light, your own truth, your Sat Nam. It has all the highlights of a great festival like live music, diverse classes/workshops, active children’ program, and an epic bazaar set in beautiful scenic environment. It is so close to Los Angeles and provides a peaceful setting for all to enjoy. The Gurdwara is vital and having the Guru on site adds to the humility, service and devotion. Dr. Haridass Kaur Khalsa, Ph.D. will be teaching “Neural Patterns for Happiness” with live music by Hansujot on Thursday, April 11 4:00 – 5:30 PM in the Sat Nam Pavilion.